Karen Rouse wants people to think a little differently about how they view senior community centers. 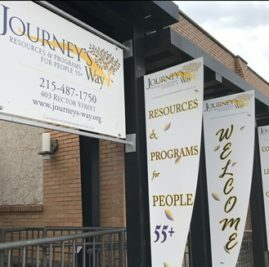 After serving in various roles at centers across the city for three decades, she is now the director at Journey’s Way, a senior center serving adults 55-plus at the corner of Rector and Pechin streets in Roxborough. “The senior center is the community; it’s not a separate part just for older people,” Rouse said. It’s that attitude that has allowed her to develop partnerships with a wide array of community members during her time at Journey’s Way, something she sees as a point of pride for the center. Rouse explained that Journey’s Way opens its doors to a number of organizations that are in need of meeting space. The local historical society, the Soroptomists — a women’s volunteer and empowerment group — and even the Philadelphia police have used the building for regular meetings. Rouse credits the converted church that houses Journey’s Way as a major asset in courting community relationships. The spacious accommodations offer an advantage over the much smaller space five blocks away that housed the center until a move in 2009. “Everything was clumped together in two or three little rooms,” Rouse said. The newer center features two stories and contains rooms of various sizes, offering enough space for large gatherings and more intimate sessions to occur simultaneously. On a recent Monday, the center was a hub of activity, hosting a meditation class downstairs while a dozen seniors participated in a workout on the second level. Down the hall through a breezeway on the first floor, others enjoyed a light breakfast in a large dining area that features a state-of-the-art kitchen. That activity level is typical, according to Rouse. “I think you feel energy when you walk in here,” she said. However, she is quick to point out that it’s not an exclusionary energy based on one’s level of physical activity. Susie Lada exudes the energy that Rouse spoke about. The spry and energetic former kindergarten teacher joined Journey’s Way back when it existed at its previous location. The difference in programing between then and now is night and day, she said. Now there aren’t enough hours in the day to fit in all of her favorite activities. She participates in Silver Sneakers, tai chi, line dancing and the center’s “News and Views” discussion group, among other activities. She also volunteers at the center, offering a helping hand to the small staff. Looking up for a moment from her morning crossword puzzle, Patricia Katz explained that she comes to Journey’s Way mainly “to play.” She can no longer swim, which was her favorite form of exercise, due to health complications. She visits Journey’s Way almost daily, interacting with other members and participating in activities such as arts and crafts classes and games. Seated in front of a jigsaw puzzle that depicts a mouse running up a fully- functioning clock — a project that took her months to complete — Katz spoke highly of the center, its members, and the unique programming that makes members welcome, no matter their level of physical activity. Though she now only cooks at home on special occasions, she is particularly fond of the healthy cooking demonstrations that are a part of the regular programming at Journey’s Way. In explaining why the concept of community is so important to the center’s mission, Rouse alluded to its name. “Journey’s Way” was chosen to challenge outdated perceptions of senior centers and focus on the positive aspects of aging, she said. “Aging is a pathway. Everyone is on a journey of lifelong possibilities,” Rouse explained. 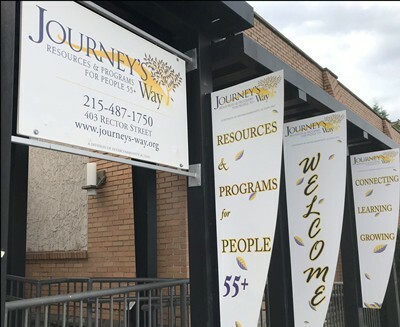 Journey’s Way, located at 403 Rector Street in the Roxborough section of Northwest Philadelphia, is open weekdays from 8:30 a.m. to 5 p.m. Housing and geriatric counseling services are available by appointment. For more information, call 215-487-1750 or go to intercommunityaction.org/aging-services.